What outdoor flea adulticide is recommended if Bifen I/T and permethrin don't work? I had a cat flea infestation inside and outside the house. The indoors was successfully treated with Precor 2000 Plus. I sprayed outdoors with Bifen IT and Martin's IGR multiple times, and that did not work. I sprayed with permethrin and Martin's IGR multiple times and that did not work. I sprayed with a hose end sprayer in the yard and a tank sprayer in tight places. I live in the Phoenix metro area and I have rocks in the landscaping. I sprayed enough to get under the rocks. I don't have any plant debris now on the ground. I don't recommend using a hose end sprayer for pesticides. The dilution rate for either of these products for flea control should be at 1 oz of chemical per gallon of water. A drop of liquid soap or a surfactant (per gallon of water) will help it to stick to the plant surfaces. It is impossible to get this exact dilution rate with a hose end sprayer. It sounds to me like the problem is that the Bifen and or Permethrin is over diluted. 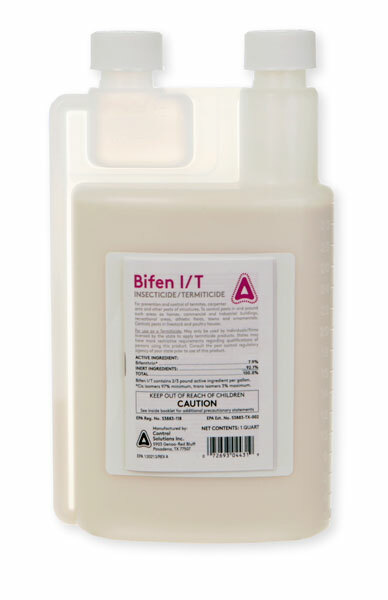 If you want something a little stronger, try Bifen XTS. It contains Xylene which gives a real kicker to the Bifen. As far as different chemicals go, in most cases you would want to change chemistry. Bifen and Permethrin are both pyrethroid class chemicals. In order to change chemistry you would need to use something that is not a pyrethroid. Temprid contains Imidichloprid which is a neonicitinoid (different chemistry than pyrethroids). Dominion 2L also contains Imidichloprid. My advice is to keep spraying something, but whatever you spray unless you have a way to mix it properly in a large spray tank, you will have to apply by hand. The rate is usually 1 oz of chemical per gallon of water - per 1,000 square feet. So if your lawn is 5,000 square feet you will need roughly 5 gallons of diluted spray. Thank you. I will try the Imidichloprid. I used way more than 5 oz concentrate per 5000 sq ft with Bifen and Permethrin using a hose sprayer. I could tell because of the total number of oz. used when I sprayed. Also, the spray looked very milky when using Bifen. I really wanted to get under the rocks since the adulticide needs contact with the flea. I also sprayed with just a tank sprayer first, but that didn't get under the rocks and it took a lot longer (the flow rate was too low with a tank sprayer).